Rennet pastes are quite different to the rennet extracts used to coagulate the milk for most varieties of cheese. Rennet pastes are produced by grinding the semi-dry stomach of the dairy animal into a paste with addition of NaCl (rather than making an extract). In addition to chymosin which coagulates the milk, rennet pastes contains a potent lipase, pregastric esterase, which leads to much lipolysis during ripening. Pregastric esterase is secreted by a gland at the base of the tongue; secretion is stimulated by suckling and the enzyme is washed by ingested milk into the stomach. 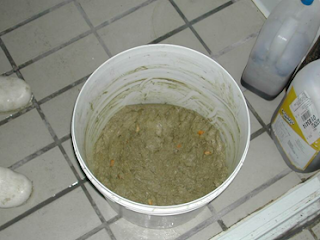 The young dairy animal (calf, kid or lamb) is slaughtered after suckling, its stomach, with contents, removed and stored for up to 60 days, and then macerated to yield the rennet paste. Lipase activity depends on age and state of stomach at slaughter, drying and salting procedures (the low pH used to activate enzyme precursors during manufacture of rennet extracts inactivates lipases and hence, unlike rennet pastes, rennet extracts should have little or no lipase activity). However, preparation of rennet pastes is time consuming and complex (traditionally, this was often done on the farm), and commercial supply of rennet pastes has been limited. Other difficulties with these coagulants include lack of standardization of enzyme activities and sometimes low microbiological quality. 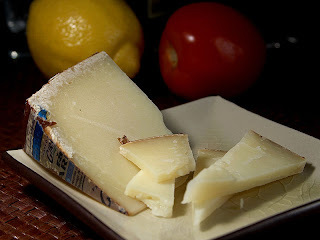 However, their use is essential in certain varieties (mostly originating around the Mediterranean basin), including Italian Provolone and Pecorino varieties (Pecorino Sardo is shown below), traditional Greek Feta and Kefalotiri, some Spanish Idiazabal. Pregastric esterase contributes to lipolysis during the ripening of these cheeses and thus to their flavour.